Service Costs > How Much Does Bagster Pickup Cost? How Much Does Bagster Pickup Cost? This product is considered to be an innovation in waste removal and is quite the cost-effective, on-demand solution for both DIY (do-it-yourself) enthusiasts as well as professional contractors in case a dumpster is too large for the task. It is big enough to hold full-sized items such as drywall, cabinets, doors, windows, bathtubs and even hardwood flooring. Using the Bagster bags, as opposed to contacting a local company to rent a dumpster, could save you time, money, aggravation, and potential property damage. It serves as an alternative to the large metal roll-off trash dumpsters. How much does the Waste Management Bagster pickup cost? With a Bagster, according to Waste Management and those who used one, you simply pay a pickup fee to Waste Management during the time you schedule your collection. Waste management charges a standard flat-rate collection fee, which ranges anywhere from $79 to $189 per bag, depending on your area. For the most part, most of the quotes we received ranged from $99 to $129. Before a pickup, however, you do need to purchase an official Bagster bag. The Bagster bag itself costs about $30, and the bag is available at the majority of retailers such as Lowes, Home Depot, Amazon.com, and Walmart, for example. 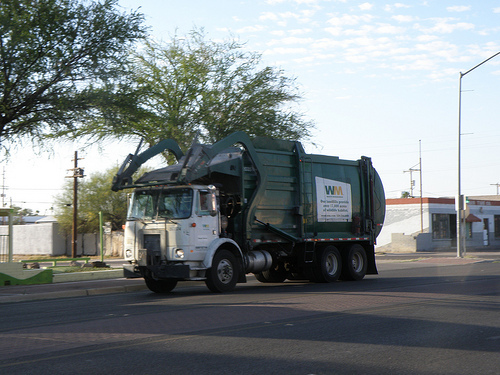 Waste Management claims the average cost can start at $140. Sherry at YoungHouseLove.com talked about her experience with the Bagster bag and noted it cost her $80 for pickup after using a $20 off coupon she found. This didn’t include the initial $29 bag cost. To use it, buy the bag at a local retailer, fill it with up to 3,300 pounds of waste, and lastly, schedule your collection either online or via phone. Pickups, depending on the schedule, will be anywhere from 6 a.m. to 8 p.m., Monday through Friday. You won’t have to be present when the truck comes to pick it up. The Bagster bag is made of a highly durable, woven bag which will not tear when punctured and is capable of holding three cubic-yards of debris and up to 3,300 pounds of construction or project debris. It only comes in one size, measuring eight feet long by four feet wide. The Bagster has no time limit. The Bagster can hold one cubic-yard of heavy materials (brick, rock, dirt, concrete, sand, asphalt, gravel and sod) and can be placed in areas that a dumpster cannot access. It can be placed anywhere within 16 feet of the driveway or street. Waste Management will collect your Bagster bag using a large truck mounted with an overhead crane which can reach up to 16 feet away from the edge of the street, driveway or alley, even over a five-foot fence. However, the Bagster bag needs to be placed in close proximity to the street so the Waste Management truck can easily access it with a hook. The fence structure must be within five feet of the street, driveway or alley. Waste Management does have some exceptions for items customers CANNOT place inside the Bagster bags. These items include mostly toxic and hazardous items such as paint, batteries, oil, fluorescent light bulbs or ballasts, electronics, appliances, railroad ties, tires, food waste, medical waste, chemicals, and pesticides. In some areas, yard waste is unacceptable. This service is only available in some areas. Check out their official website to see if they service your zip code. For safety reasons, Waste Management will keep the bag upon collection. The company does offer discounts for additional bags at the time of pickup. Each additional bag is usually about 40 percent less than the first one. Customers stated you can often find a $20 off coupon online if you search. Searching for “Bagster coupon code” on Google, for example, should yield some results.